What were the "disastrous" results of breeding DS with GSD? I've read a few accounts of the alleged history of the DS. They all mention the breeding programs that took place after WW I in an attempt to widen the gene pool after the breed was greatly diminished. A couple mention that crossing the DS with GSD turned out badly. One even stated "disastrous." However, I've seen no actual explanation as to why it was so bad. Anyone have a more detailed, and reliable, source of information on this issue? I'm curious because my girl is 1/2 and 1/2, and she is most definitely not a stable dog. The owner of one of her brothers (I've never met her or the dog in person), thinks her boy is great, and planned to breed him. She ended up getting a female DS/GSD that apparently has similar issues to my girl, so had her spayed, then got another DS/GSD female that she initially thought would be a good candidate for working, but the dog went into heat, mated with the male, and ended up having a litter. Turns out mom is also a nervy, fearful dog. Now there is an entire litter of dogs with nervy, fearful dam and a sire that has a nervy, fearful sister. Great! So I think there is certainly something to this "disastrous" results of breeding DS and GSD. But I'm curious if this is the type of problem encountered during the breeding program. And if so, why is there is propensity for the combo to produce unstable dogs? Re: What were the "disastrous" results of breeding DS with GSD? Idk that it has anything to do with DS vs GSD than it does with just genetics in general. Just cause you have a male and a female doesn’t mean they should breed them. There is a reason that some pups cost a few thousand dollars and other a few hundred. This is why. Bloodline means a lot in a dogs temperament. this is why people should not breed their dogs just because they think they are great. Yeah, I agree. But still no answer to the question about the history of the DS and the alleged "disastrous" results of breeding DS with GSD. Though I did post this on a DS facebook page and someone provided a quote from someone's history of the long-haired DS. Apparently that's the origin of the reference to the terrible results, as the author discusses how the long haired DS had not been part of the breeding efforts, and therefore had not suffered the deleterious effects of a GSD influence. What would the benefit be to breeding the two together? I would guess to hope all the best qualities would be in the form of one canine? That seems to be a long drawn out story (I apologize but I didn’t read the whole thing) to tell vs something that’s much more simple to understand. I dont believe it to have anything to do with a DS x GSD. It has to do with the genetics of the nervy dogs they carelessly mated. Sounds like both dogs had some genetic issues that lead to their lack of confidence and fearfulness they are seeing and it was passed down to the litter. The way dogs are bread mostly line breeding like horses rules out differences in their genetics and produces similar dogs. When you cross genetic lines you open up a whole can of possibilities and differences. It’s the line breeding that keeps the pups coming out looking similar, having similar confidence levels, and similar physical, chemical, mental traits from what I understood. I don’t think there’s any kind of voodoo about mixing GSD with DS that just sounds like... story time stuff. I’m sure it could be done properly. See I'd have no problem buying DS if it has generations of titled KNPV dogs. Everyone here who has a DS feels probably the same. However GS are all over the place. Maybe some of the DDR GS lines might be a good fit but I wouldn't want to invite the hip problems into the DS lines either. 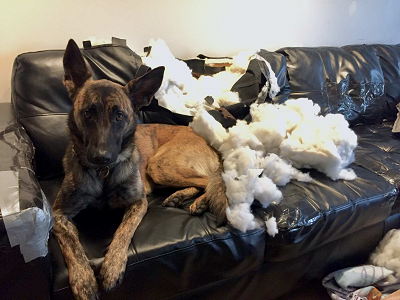 "He never hid his dissatisfaction with the shorthaired Dutch Shepherd of that time. He repeatedly told me his motives: too much German type, nervous dogs and a breeding- and judging policy that promoted all this. After what I had seen at shows I could - despite my age - see how he had come to this opinion.... And this is what Dr. v.d. Akker was looking for, longhairs straight from the Brabant countryside, working dogs that were untainted by shows, fashion or crosses with German Shepherds for height or sharpness. He often spoke to me about it: dogs that had a stable character and breed typical in conformation, used to sober food, loyal and reliable." My understanding of what happened is pre-WWI when there were much fewer differences between the breeds. They wanted some traits specifically size and since brindle is a dominant color, btw that’s why a “black DS” isn’t a thing it’s not possible, they bred some dogs with nice size to get what they wanted. (I think this was related to police work for easier takedowns but I can’t remember). Remember the breeds didn’t split until the 1890s so these “breeds” had been in existence for a decade at best. So you’ve got people who barely even know how to make a breed in the first place, much less know anything about genetics, crossing in dogs for superficial reasons from other people who know next to nothing about establishing a breed or genetics. Is it any surprise at all it went “disastrously”? I don’t know what specifically the “disastrous” traits were, but I highly doubt it had anything to do with GSDs being a poor match to cross with DSs. There’s a boatload of crosses between GSDs, Mals, & DSs that are great dogs coming out of the KNPV program among other places, now that people know what they’re doing.